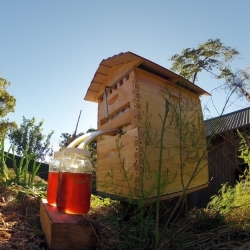 Honeyflow, a new take on the honeybee hive that allows you to collect and watch the honey flow from the hive! FEATURED Duchess Bake Shop & Provisions in Edmonton have become quite the pastry destination. 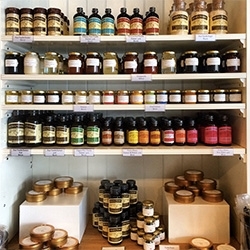 Provisions offers an impressive selection of hard to find baking ingredients, tools, and cookbooks. Take a peek inside, and at their new cookbook! 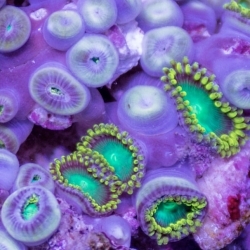 VIDEO...meanwhile...an short film capturing underwater marvels from Sandro Bocci. An appetizer upgrade that is elegantly luxe looking, but pretty darn simple to pull off. 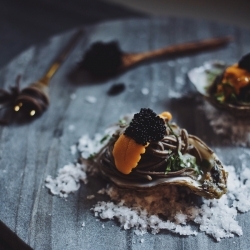 Oyster on the half shell topped with wine-butter infused black soba noodles, uni and caviar. FEATUREDIcewalk through Maligne Canyon in Jasper National Park. 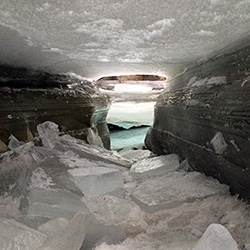 Over and under the ice shelves (i crawled in there! ), squeezing behind walls of ice and more to experience the inspiring ice formations. Bucket list worthy for sure. 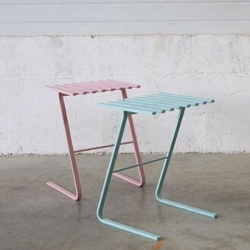 YOIN Design & Craft designed the Pool Chair after reflecting on memories of climbing up from the pool after swimming. 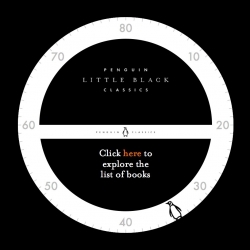 Mathieu Triay's Little Black Classics for Penguin ebooks. 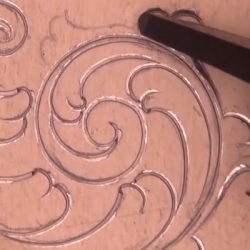 VIDEOHand Push Engraving With the Speitzer/Onglette Graver by Sam Alfano. 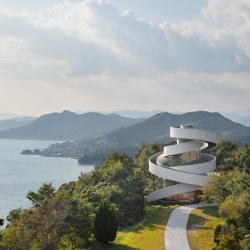 Ribbon Chapel by Hiroshi Nakamura & Nap Co. 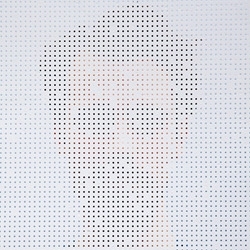 They're called Dutch Invertuals and for the past few years have been the protagonists of bizarre communication campaigns to present their works at Dutch Design Week in Eindhoven. 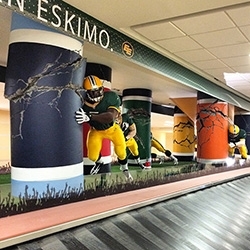 Mike Bain turns airport runways into abstract art. 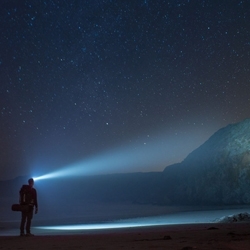 The newly designed TE14 Headlamp flashlight by Third Eye Headlamps lights up the cliffs at Sand Dollar Beach in Big Sur, California. FEATURED Oliver Apt Cutting Board Workshop in Edmonton! 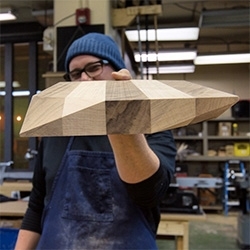 We hop in the studio with 3rd generation carpenter/designer, Landon Schedler, and make laminated, faceted, walnut and maple cutting boards. See how it's done. 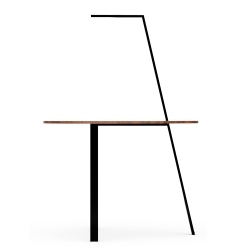 Table Leaf ntroduces an organic tabletop, shaped with an elegant design and handcrafted african sustainable sucupira hard wood, dualing a material dialog with hi-tech anti mosquito coatings and his impressive black lacquered tittanium smooth structure. 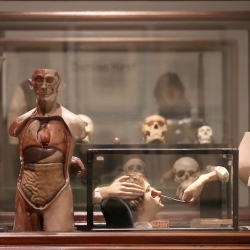 A look at the Barbican's Magnificent Obsessions exhibition by Creative Review. 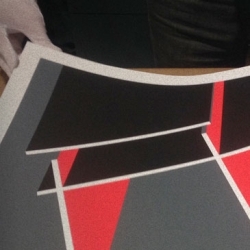 VIDEOPaint. 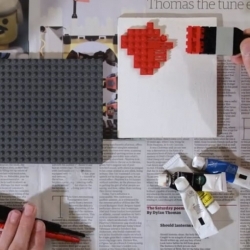 A Short Lego Film by Jon Rolph. 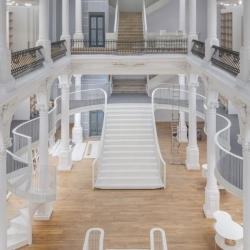 Cărtureşti Carusel Bookshop in Bucharest Romania designed by Square One in the Chrissoveloni bank building. 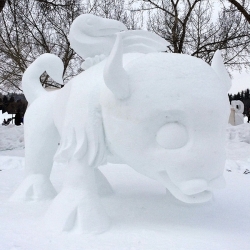 FEATUREDEdmonton Silver Skate Festival -The perfect intro to all things winter fun: dog sledding, ice skating on the frozen lake, snow sculptures, snow mazes and ice slides, live music, and so much more. 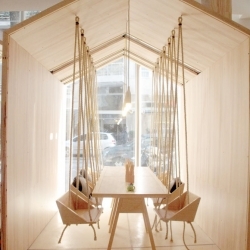 The kid friendly Fiii Fun House by Íris Cantante in Buenos Aires, Argentina featuring a variety of spaces including a table with swings for chairs. Design firm +tongtong was enlisted to reinvent a tired bed and breakfast and original, c. 1880 foundry into an 11-room and two-suite contemporary inn, the Drake Devonshire Inn in Wellington. FEATUREDElk Island National Park is filled with Bison! 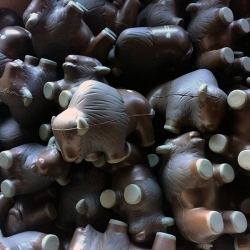 (They also have adorable stress bison in their visitor's center) And it is just outside Edmonton! Incredible how many bison you can see even from the highway going through. 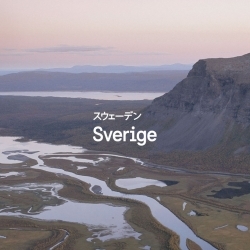 Söderhavet develop Sweden Sans, a national font for Sweden. 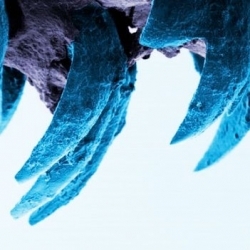 Researchers believe teeth of the limpet may be the strongest natural material (even stronger than spider silk). 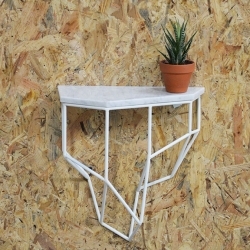 MSGS is a set of shelves with various sizes and shapes inspired by the profile of icebergs. The use of marble appeared obvious as refering to the precious and pure characteristics of icebergs, while the structure of steel represents their geometry. 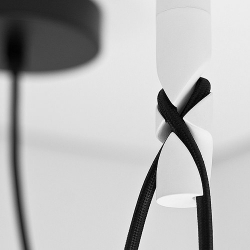 This project is the outcome of a collaboration between designer Lucas Stoppele and designer Jean-Charles Kien. 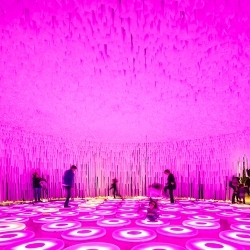 LIKEarchitects designs wonderWALL, an exhibition space with 20,000 fabric strips, to host Jen Lewin’s interactive light installation, ‘The Pool’. 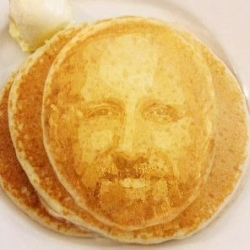 Using facial recognition technology to print your face on a pancake and more twists on pancake day. 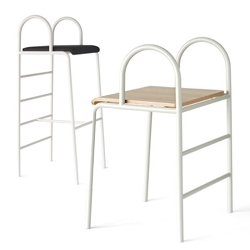 Tabouret LS01, a stool from La Subtile that slots together. 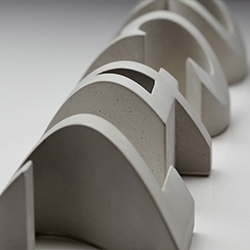 'Numeral' collection of 3D house numbers by Daast. 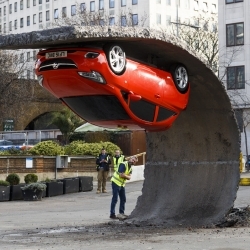 A playful and somewhat irreverent approach has been taken to the utilitarian role of numbers as functional signifiers. 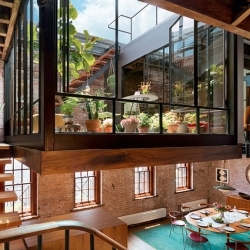 Gorgeous Tribeca Loft conversion by Andrew Franz transforms the 1884 caviar warehouse. 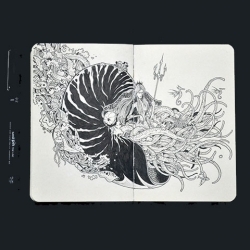 Gorgeous black and white doodles from Kerby Rosanes. 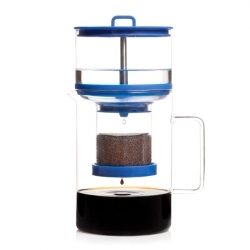 The cold bruer uses a slow drip process and looks beautiful too. Incredible wire scukptures by Kendra Haste. 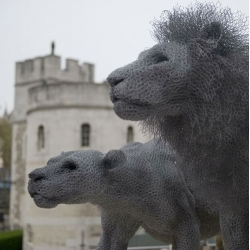 The artist currently has an installation at the Tower of London. 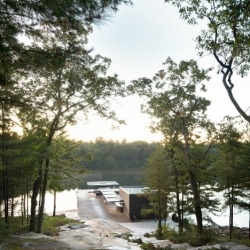 Boat House in Georgian Bay, Ontario by Weiss Architecture and Urbanism. 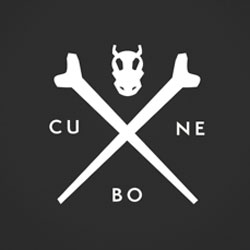 Pokémon Rebranded As Corporate Logos by Pictogram. 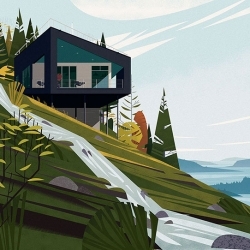 FEATUREDInspiration: YEG! Stepping off the plane for Part II of the NOTCOT Alberta Great Escape, Edmonton Airport has a stunning living wall and surprising displays at the baggage claim carousels! 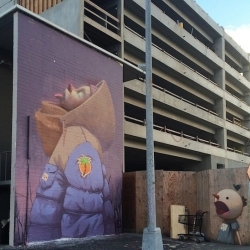 Streetart: New Pieces by Etam Cru for POW! WOW! Hawaii 2015. 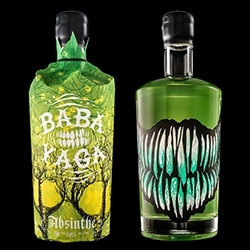 Baba Yaga - an new absinthe from Arbutus Distillery - has a bottle sleeve that reveals a wicked, toothy grin when it's removed. Smart Rope is an LED-embedded jump rope that works with your smartphone, displaying fitness data in mid-air, right before your eyes. 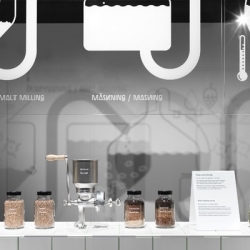 Stockholm's Spiritmuseum on Djurgården includes a beer gallery designed by Form Us With Love. 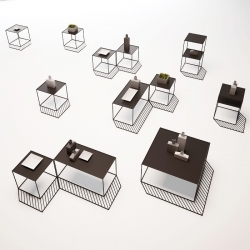 OFFSET BOXES & TRAYS. 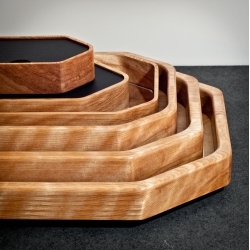 This project is a series of geometric wooden trays and boxes of different sizes and shapes. 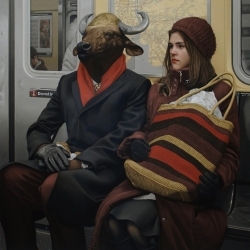 "Anomaly" - Realistic Oil Paintings of Fabled Characters and Creatures In The Modern World by Matthew Grabelsky. 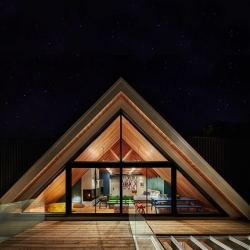 Cabins, a new title from Taschen by Philip Jodidio. 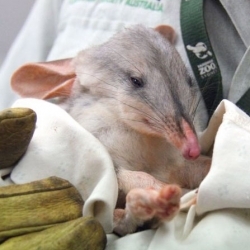 The unusual face of a baby bilby at Taronga Zoo. 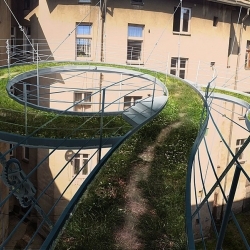 Polish Zalewski Architecture Group designed a walk-on balcony suspended in the middle of a dark courtyard in Gliwice, Poland.